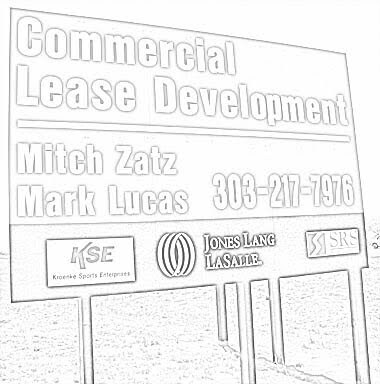 Commerce City "We need to be sure that we are not left behind in ED..."
Will we ever see Development @ the Prairie Gateway site in Commerce City, CO??? It has been years since the Commerce City Civic Center and Rapids stadium have been built and still no economic development. I guess patience is really a virtue. Brighton City Manager Manuel Esquibel announced today the resignation of Raymond Gonzales, Brighton’s Assistant City Manager for Redevelopment, Economic Development and Community Resources Office (REDCo) and President and CEO of the Brighton Economic Development Corporation (BEDC). Gonzales has accepted a position as Vice President of Energy Client Services for SOS Staffing. Gonzales’ last day with the city is Feb. 10. The National Western Stock Show Executive Committee has been researching options for relocation or rebuilding on our current site for more than ten years and we will stay focused on working to find the right solution for the long term success of the National Western Stock Show and Rodeo. Keeping the original vision of a charming downtown shopping area in mind, Cantor Partners – who recently purchased part of the Brighton Pavilions – sees the shopping destination as a tremendous asset for downtown Brighton. El Jardin, Inc. is expanding the restaurant in the Derby area to include a lounge. The expansion will replace the currently under-utilized patio area on the west side of the building. The construction budget for this expansion is $250,000. The company also plans to hire up to six new employees. COMMERCE CITY, COLO.- Over the last 10 years, the Rocky Mountain Real Estate Challenge (sponsored by NAIOP, the Commercial Real Estate Development Association) has created visionary development ideas for sites such as Solterra, the Denver Coliseum and most recently 9 Mile Station. The 65-acre Mile High Greyhound Park joins that illustrious list, with today's selection as the Challenge's 10th anniversary project. · Leading economic indicator advances to a healthy level. · Business confidence index slumps to recessionary level. · Approximately 28 percent of firms expect layoffs in the next six months. · Supply managers expect an average 1.8 percent raise in the next year. COMMERCE CITY – Four local business leaders were honored for their achievements and community contributions during the fourth annual Business and Investor Appreciation event held in Commerce City. METRO NORTH REGION, COLO --- The Metro North Chamber of Commerce (MNCC) in partnership with the MetroNorth Newspapers is hosting a local candidate forum on Wednesday, September 14th from 5:00 – 10:00 p.m. at the City of Thornton Council Chambers (9500 Civic Center Dr., Thornton) for the communities of Brighton, Broomfield, Commerce City, Northglenn and Thornton. · Leading economic indicator dips to a healthy level. · Employment gauge is consistent with annualized job growth above a healthy two percent. · For the remainder of 2011, approximately 14.3 percent expect a decline in business activity, 33.4 percent anticipate an upturn in sales, and the remaining 52.3 percent expect no change in business activity. · Business confidence slumped below growth neutral. COMMERCE CITY, COLO. - With construction equipment moving in the background, more than 40 attendees celebrated the official groundbreaking for the 123,000-square-foot King Soopers MarketPlace in Commerce City. The new store, opening in fall 2012, will be the cornerstone for Shea Properties' 22-acre Reunion Marketplace Center, located at 104th Avenue and Chambers Road. Despite opposition from numerous residents, members of the ACSD#14 school board and the city of Commerce City, the Adams County Planning Commission, in a 4 to 3 vote. recommended approving a plan by Waste Solutions. This plan will put a medical-waste sterilization facility at 8620 Brighton Road. The closest residential lot is 1/10th of a mile away. The Commerce City Urban Renewal Authority (URA) recently purchased the former Mile High Greyhound Park property for $3.3 million and will soon start planning a mixed-use development for the 65-acre site. Bounded by 64th Avenue to the north, 62nd Avenue to the south, Holly Street to the east and Dahlia Street to the west, the property offers access to several highways and connectivity to the heart of historic Commerce City. Each year, the Business and Investor Appreciation event provides the opportunity for the city to say thank you to businesses, property owners and other organizations for their investment in Commerce City. This year’s event will be a breakfast held Friday, September 9, 7:00 - 9:00 a.m. in the Council Chambers at the Civic Center. The annual Business & Investor Appreciation event celebrates the great things Commerce City business make happen in Commerce City, and recognizes specific businesses for their success and contributions to the community. Nominate your business or another Commerce City business by Friday, August 26. UE Compression, LLC, located in Commerce City at 6030 E 50th Ave. is growing and is making plans to consolidate and expand its operations into a new facility that will be constructed. The total estimated capital investment is $10.8 Million. In addition, the company expects to create nearly 60 new jobs. Commerce City Dog Track is a "Colorado Enterprise Zone"... What does that mean? The Colorado's Enterprise Zone program provides tax incentives to encourage businesses to locate and expand in designated economically distressed areas of the state. There are currently 17 Enterprise Zones and 2 sub-zones in Colorado. Businesses located in an Enterprise Zone may qualify for up to nine Enterprise Zone Tax Credits that encourage job creation and investment in the Enterprise Zone. 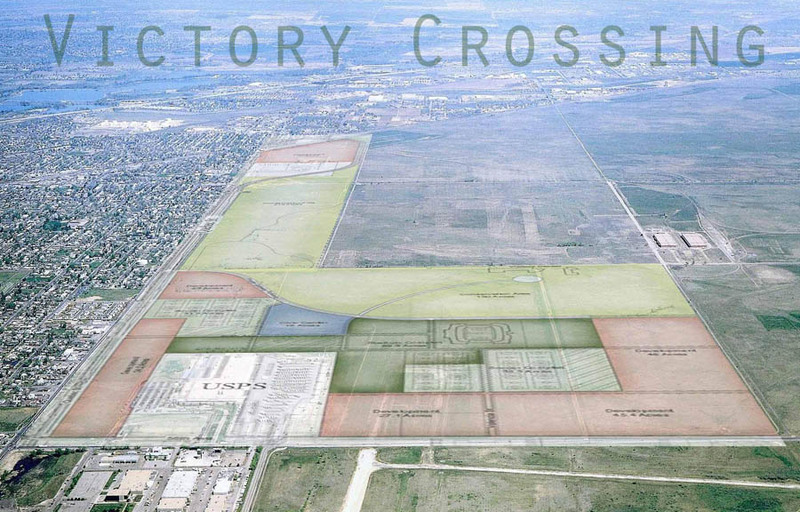 Commerce City as a local jurisdictions has additional incentive opportunities in this Enterprise Zone (old dog track). On Aug. 5, 2011, Standard & Poor's Ratings Services lowered its long-term sovereign credit rating on the United States of America to 'AA+' from 'AAA'. The outlook on the long-term rating is negative. At the same time, Standard & Poor's affirmed its 'A-1+' short-term rating on the U.S. In addition, Standard & Poor's removed both ratings from CreditWatch, where they were placed on July 14, 2011, with negative implications. Now through September 30, Canopy Airport Parking near DIA is offering EXpressToll customers a "Summer Special" of $5 per day for outdoor parking and 25 percent off of its regular covered self-park and indoor valet rates. Customers must have a properly mounted EXpressToll transponder and a coupon printed from the EXpressToll Rewards page at www.expresstoll.com. COMMERCE CITY, COLO. – The Commerce City Urban Renewal Authority (URA) today announced the purchase of the former Mile High Greyhound Park, a 65-acre site in the heart of Commerce City. · Inflation gauge declines to a still elevated level as supply managers raise their expectations for the next six months. · On average, supply managers expect a paltry 1.5 wage gain over the next year. Schlumberger, a Commerce City business located at 9251 E. 104th Ave is proposing to use the northern undeveloped portion of the site for outdoor storage. The storage materials would include steel racks, equipment, storage containers and trailers. As the National Western Stock Show & Rodeo has scouted the metro area for a new location over the years, it has also been looking for a partner to help broaden its appeal. COMMERCE CITY – Julie Jacoby has joined Commerce City as an economic development specialist. In this role, she will be focusing on expanding and supporting retail development within the city. Northern Range Commerce City Citizens - Get Ready to Celebrate!!! Before I say anything else, (drum roll please) King Soopers IS coming to the corner of 104th Avenue and Chambers Road in Commerce City. The first signs of construction started this week on the site and a store opening was confirmed today by King Soopers themselves. The King Soopers Marketplace, all 123,000 square feet of it, will open in the summer of 2012 and will be the fourth store this size in Colorado. Two are already open in Greeley and Ft. Collins, if you want to go see what your future store will look like. A third store will be opening in December of 2011. Employers in Colorado added 4,500 nonfarm payroll jobs from May to June for a total of 2,236,200 jobs, according to the survey of business establishments. Government declined by 2,600 payroll jobs and the private sector added 7,100. IKEA, the world’s leading home furnishings retailer, today announced that when its Denver-area store opens in Centennial, CO on July 27, it will recognize loyal, enthusiastic customers by giving away thousands of dollars in gift cards and merchandise – including an iconic EKTORP sofa for each of the first 38 adults in line, and a POANG armchair for the next 100 visitors. (Customers may begin lining up on 9 a.m. MDT on Monday, July 25 – 48 hours in advance of the doors opening at 9 a.m. MDT on Wednesday, July 27.) Also, Colorado Governor John Hickenlooper, Centennial Mayor Cathy Noon and IKEA U.S. president Mike Ward will join IKEA Centennial store manager Kelly Frieze in the official opening of the new store. Small businesses are an important part of the Commerce City community. Did you know there are resources available to help support the success of your business? A Team of 6 with one mission... ED! A Colorado Municipal League mid-year survey of municipalities reveals both Commerce City and Brighton had positive numbers to report. For the first four months of 2011 compared with the same period of 2010, Brighton listed a 7.41 percent increase in sales tax revenue while Commerce City reported a 27.5 percent increase. Both cities viewed the local economy as improving. A Colorado Municipal League mid-year survey of municipalities reveals 62 percent rate their economic picture as improving. The amount of improvement ranges from slight to strong but the local economies have turned a corner. 30 percent rated their economy as flat, while eight percent said the economic picture was getting worse. Lenders will soon be required to disclose credit scores to consumers when their scores are used against them to set poor credit terms or when the lenders deny access to credit altogether, which will significantly increase financial clarity for consumers. The Metro North Chamber of Commerce (MNCC) is taking business and the community to new levels this year, specifically to an international level through a recently launched business/leisure international discovery program . Chamber partners and interested international travelers are invited to travel with the Chamber to Tuscany this fall to participate in a unique experience that is slated to mix a little bit of business with a little bit of pleasure. Departing on November 8, 2011, the eight day journey to Tuscany, one of the most popular tourist destinations in the world, will include airfare, transfers, first class hotel accomodations, superb cuisine daily, a designated guide, tours, winery visits and the opportunity for business professionals, who are interested, to connect with professionals and businesses in their respective industries. The Metro Denver region continues to see solid summer tourism numbers and employment indicators--such as increased nonfarm employment and declining unemployment claims--show positive momentum, according to data compiled by the Metro Denver Economic Development Corporation (Metro Denver EDC) in its Monthly Economic Summary for July 2011. · Leading economic indicator rises to a healthy level. · Inflation gauge declines to a still elevated level. · Almost twenty percent of firms reported supply disruptions for month. State Senator Mary Hodge will be hosting a Small Business Growth Forum Thursday, June 30th, 2011 at the Commerce City Civic Center, 7887 E. 60th Avenue, Commerce City from 6:30 to 8:30 p.m.
Commerce City Rotary Club 19th Annual Golf Tournament Classic. When: July 15, 2011 Time: 7:00 am Where: Buffalo Run Golf Course - Commerce City More information to come on Sponsorship and individual player opportunities! 100% proceeds from the tournament go to Commerce City Rotary Club Foundation/Youth Programs. If you are not able to sponsor or play but would like to support, we are also looking for raffle items i.e. gift cards, golf apparel and goody bag items i.e. water, chips, granola bars. 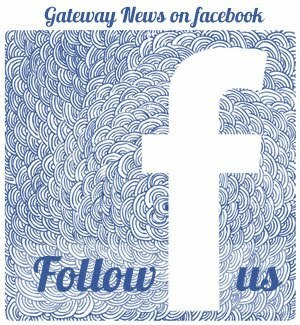 Contact Maria Carabajal at 303.921.700. Any questions regarding the golf tournament please contact Joseph Frei at c#:303.913.6541... Fee: $150.00 per Person... Location: Buffalo Run Golf Course, 112th and Chambers, Commerce City, CO, 80022. Gaylord Entertainment (NYSE: GET) announced today its plans to develop a resort and convention hotel in Aurora, Colo. Located less than ten minutes from Denver International Airport, one of the most well-traveled and accessible airports in the world, and 25 minutes from downtown Denver, Aurora is ideally situated for both business and leisure travelers. The Aurora site will be located on 85 acres in LNR Property CPI Fund's High Point Master Plan Development, and will feature breathtaking panoramic views of the Rocky Mountains. The company expects the resort to be open for business in mid-to-late 2015. AURORA - The owner of the Grand Ole Opry and four of this country's largest convention hotels is coming to Colorado and bringing with it hundreds of new jobs. METRO NORTH REGION, COLO --- Community members from throughout the Metro North region are invited to take part of the fun being rolled out by Your Metro North Chamber of Commerce and its annual Chamber Challenge 5K Race & Walk. The event, which is expected to draw over 500 participants, will take place on Thursday, July 28, 2011 from 5:30 – 8:00 PM at Multipurpose Fields Trail located at 108th & Colorado Boulevard in Thornton , CO . Runners and walkers can participate in three waves that include categories for competitive runners, runners/joggers and walkers. Participants from all age levels are welcome. Kum and Go, L.C. d/b/a Kum and Go Foodstores, LLC has applied for incentives for a potential gas and convenience store that would be located in Turnberry Marketplace at 12241 E 104th Ave in Commerce City. In the event the company decides to proceed with development of this store, the estimated total capital investment will be $2,564,186 - nearly $1,500,000 for construction of the new facility and more than $1,000,000 for the store equipment. Employers in Colorado added 4,200 nonfarm payroll jobs from April to May for a total of 2,234,300 jobs, according to the survey of establishments. Government added 900 payroll jobs and the private sector increased by 3,300. Commerce City: "Retail growth on the horizon"
Commerce City was well represented at this year’s International Council of Shopping Centers Global Retail Real Estate Convention (ICSC RECon). A record number of meetings and a public presentation of the city’s retail opportunities were used to promote the city at this leading annual retail real estate convention. Commerce City: "CALL FOR RESIDENTS IN THE SOUTHERN CORE PART OF CITY!" In March Commerce City announced that Economic Development Advisory Committees – a Citizen Advisory Committee (ED-CAC) and a Business Advisory Committee (ED-BAC) are being formed. We were amazed at the number of quality applicants who want to contribute their time and energy to helping the city implement the Commerce City Economic Development Strategic Plan. Unfortunately, the city did not receive many applications from residents in the Southern core part of Commerce City. Therefore, the city is kindly asking for your help in identifying residents in the Southern Core to assist us in this effort. *Northglenn Sales Tax will be 4.00% excluding food for home consumption, which will remain at 3.50%. According to the recent Retail Coach Report, existing retailers cannot meet the demand of the city’s growing population. 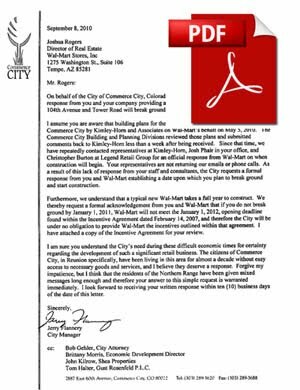 The residents of Commerce City are shopping and spending their money in other cities and that is what is known as “leakage”. How bad is the leakage in Commerce City? It is around $300,000,000 annually. It is time for the city to try and recoup its losses. This Retail Coach Report is with the Economic Development team in Las Vegas at the ICSC (International Conference of Shopping Centers) to show potential businesses what opportunities are available right here inside the city. Lets Move Some Dirt in C Town!!! Commerce City Economic Development Responds to the Commerce City development and business community with the 2010 Incentive Package. According to Commerce City: "The incentive program was created to: Positively impact all facets of the Commerce City economy; Create jobs and encourage existing businesses to make capital investments; Spur new office, industrial, and residential development and growth; and, Create new retail opportunities that cause the reduction in retail leakage. The package addresses the top incentive needs and desires identified by the Commerce City development and business community." Incentive Package has deals for everyone including Existing Business, Prospective Business, New Retailer, Existing Retailer, Home builder, Homeowner, Green Businesses and Green Building Practices and Projects of Economic Development Significance.